Solving complex technical challenges is a daily regimen for Prototype Casting Inc. (www.protcast.com), a casting company in Denver, Colo., that specializes in providing custom castings quickly for prototype purposes. "Our overall strength is the ability to provide precision castings to a client in as little as three days, in some cases allowing the client to validate a product design or complete a production run with a limited number of castings," said John Gode, the company's sales and marketing manager, in an email response. One challenge for the Colorado manufacturer was a military communication housing that required excellent quality and needed to be produced in a short time frame. The client also needed the hand-held housing to be lightweight, with excellent EMI shielding characteristics. Machining and plating would also be required before the project could be completed. "Prototype Casting was able to suggest using magnesium for the cast housing, thus saving a third of the casting weight over an aluminum [casting] and providing 9.8 times the EMI shielding over aluminum," said Gode. "The client required 40 casting sets in six weeks for military testing. This project was cast using the RPM (rubber plaster mold) method to simulate die casting. We cut polyurethane masters in a CNC machine and made a silicone tool to make the plaster molds." The company serves several high-tech markets that employ castings in their product designs, including the military, medical, automotive, consumer goods, electronics, and aerospace industries. Among the parts produced are housings for the electronics, automotive, and consumer goods markets; electronics housings with integrated heat sinks; and castings for automotive power trains, office furniture, home appliance components, and structural components. In addition, Prototype Casting makes valve housings, lightweight castings for the Department of Defense, and housings that provide EMI shielding. To make these prototypes, the company offers five different casting processes, from rapid investment casting to rubber plaster molding and precision sand casting. Prototype Casting has been in business for over sixteen years, and routinely works with aluminum, magnesium, zinc, stainless steel, and a variety of other alloys. "Our services provide the client's design engineers [with] the opportunity to inexpensively test the form, fit, and function of their product design prior to expensive production tooling," says Gode. "Our design engineers work with client engineers to provide design improvements and best practices to optimize the overall project outcome." 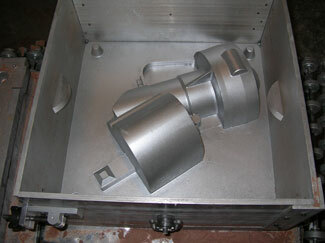 Machined parts and tooling are also available from the company. A UMG Mori Seiki CNC machining center was recently added to the company's machine shop, which already included three CNC machining centers that were mostly dedicated to tool cutting operations. On several occasions, clients' projects have required tolerances of +0.0002/-0.0000 for intricate bearing bores. "There are times when cutting a part from stock is the only way, or the most economical way, to produce it," the company states on its website. "Our full-line machine shop is staffed with both engineers and operators who are capable of producing the highest quality parts." Engineering support is a foundational priority at Prototype Casting, which employs eight mechanical engineers on a staff of 30 people. In addition to offering basic feedback on casting and machining processes, the company offers reverse engineering, 3D CAD modeling, and finite element analysis, as well as complete inspection and finishing services. "This includes radiographic inspection, dimensional inspection, and dye penetrant inspection," says Gode. "Finishing services include heat treating, chem film, impregnation, and liquid or powder coating. Basically, we can give the client a turnkey part."